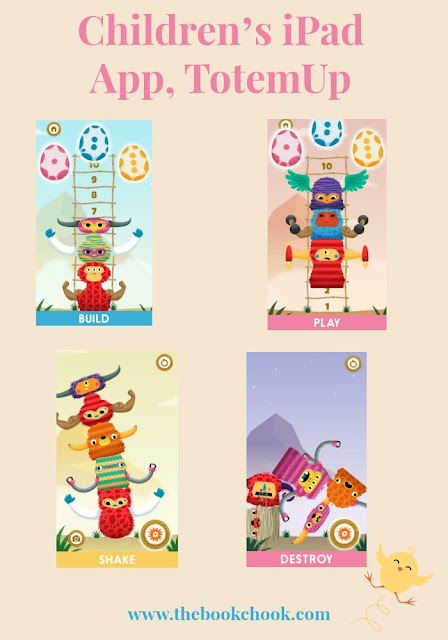 TotemUp is an educational and creative app for preschoolers. I have previously reviewed Minilab’s Artie’s Magic Pencil. -No goals or objectives, simply an endless digital toy experience! TotemUp is a digital toy which offers young children the opportunity of free play in an environment where little monsters can be created, customised, popped into a ladder/tower, then knocked over when the ladder is full. I really like the way the app mirrors real-life play - isn’t it amazing how many times little ones can build and knock over a structure while giggling helplessly? At the same time, kids are indirectly learning about maths. Eggs can have 1, 2 or 3 dots and the monster that emerges is correspondingly of 1, 2 or 3 ladder rungs in height. This means when kids add a 1 monster to a 2 monster that is taking up two rungs, they will see the combined monsters now take up three rungs. The fun comes in with creating different monster combinations according to easily navigable buttons, and then seeing the subsequent animations. I loved how the developers included a way for kids to take a photo of their monster ladders, and the very cute and attractive colours and patterns that go to make up a monster. The developers have also included a parent’s area which has a text box for parents to enter their birth year, and this area has access to a store. Get more of an idea about TotemUp from the video below. Check out all of my iPad App Reviews on Pinterest, and find more apps and articles via my Listly page. I’ll be adding this app to my List, Creating with Children and iPad Apps.